Ahora, no puedo decir: "obtendrás un cinco en el examen de Español". Pero, puedo dar algunas recursos que me estan ayudando. Posible, puedan ayudarte tambien. ¡ Buenas suerte! Now, I can't say: "you will obtain a 5 on the AP Spanish Exam." But, I can give some resources that are helping me. Possibly, they can help you also. Good luck! Yes-- for me, it's only 6 days away, and I am officially in panic-study mode. Granted, the most important things on this exam are things I have learned all year, but I feel the urge to make sure I get as much in my head as possible before Tuesday morning. The past few weeks, there are a few tools that have been especially helpful. If you are prepping for the test, are a Spanish student, or just happen to be curious about my blog, I encourage you to take a look at what all is out there. I guarantee that at least one of these study tools will mesh with your style, and help you in the coming week. According to my Spanish teacher, this is one of the easiest ways to study-- and it truly is! While it's good to listen to the words and try to translate, it's also fine to just listen. It's amazing what your brain picks up through passive listening. It also helps to get used to the normal speed of speech in Spanish. I've been turning on the Spanish talk radio on the way home from school the past few days, and am already coming to enjoy it! For this year's test takers, it might be a little late for this one. However, you can always start a book and continue it until you finish. 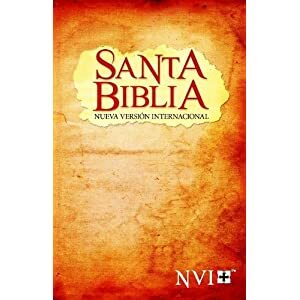 I have been asking for a Spanish Bible forever, and I finally just purchased one myself off of Amazon a few weeks ago. It was only like $2.70 (and we have free AmazonPrime shipping), and it has mixed up my normal Bible reading routine. No, you won't understand all the words in whatever book you choose to read, but there is such value in learning to decipher words from their context. This will help you immensely on the exam as well. I would suggest you try to do some Spanish reading at least once a day for 10-15 minutes. Not only will it be fun if you love Spanish like me, but it will also be a fun way of studying! This is pretty similar to the suggestion above, except it is accessible on your smartphone or iPod. I have the Univision app, as well as a Spanish news app. Now I can read quick articles about what's going on in Spanish speaking countries, as well as get a feel for the context and culture that will be presented on parts of the exam. The AP website has plenty of tools available for review, including exam preparation and key concepts to know. I've yet to actually use this one, because frankly: its the most boring! However, come this weekend: I'll be doing a few practice tests on there (and on our school's resources and class webpage with listening activities) to make sure I'm as test hardened as I can be. I want to know exactly what to expect on exam day, and this is a great way to ensure that. This is a great way to study, as long as you stay focused and have a clear objective. Beforehand, set an agenda for what concepts you all would like to review and need help with. Keep it short, so you are able to stay on task and work diligently. Whether you do so with your family, on your own, or with your class: head to a Spanish restaurant and try out your speaking skills in a real life situation. Most likely, they will be gracious if you are a little slow to order and respond. Work on trying to speak in a consistent flow though. This quick thinking, conjugating, ect.., will help you on the speaking conversation part of the exam especially. Never underestimate the power of Google. While there are many uncredible websites out there that have no clue how to teach you Spanish, there are also some great review games that can help you have some fun while studying. Sites like Quizlet and Quia are great. My Spanish classes for years have used both. Be careful to evaluate the credibility of such sites however. If it is a standalone site, make sure it is an education establishment or actual test preparation site, to avoid learning wrong information right before the exam!